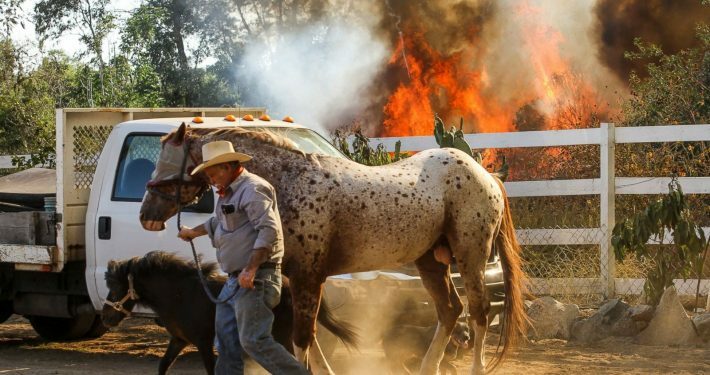 With fires burning in every state on the west coast plus Montana and hurricanes with flooding in Texas, Louisiana and soon Florida, it is the perfect time to review a few things we can do to help reduce the stress our equine partner may be facing. A few minutes spend supporting our horses after the disaster will help reduce the stress and problems down the road. Wildfires – The unhealthy air containing wildfire smoke and particulates can build up in the respiratory system, causing a number of health problems including burning eyes, runny noses and illnesses such as bronchitis. They can also aggravate heart and lung diseases such as congestive heart failure, chronic obstructive pulmonary disease, emphysema and asthma. Limit any exercise. “If you see smoke don’t work your horse”. Provide constant access to clean water. Water keeps the airways moist and facilitates clearance of inhaled particulate matter. Body Balance Respiratory Formula – This herbal combination promotes a healthy respiratory system. It will assist the body in clearing upper respiratory congestion and boost the immune system. Body Balance Immune Builder – This synergistic blend supports the immune system as well but is an anti-viral, anti-inflammatory and assists the kidney and liver function. This will head off any type of viral or bacterial conditions. Flooding – In fast rising floods horses can be swept into obstacles, including fences and corrugated iron, which can cause seriously injuries. Mud can pose a serious hazard for stranded horses. If trapped and immobile they can fracture a limb or seriously injure themselves struggling in deep, sticky mud. Eye injuries are commonly sustained when horses attempt to pull themselves free and hit their faces on stalls or fencing. Other hazards common to horses after floods include rainscald, mudfever, foot problems, pneumonia, wounds (especially to the legs), waterborne illnesses such as leptospirosis, and problems from drinking contaminated water or eating mouldy food. As we have seen in the flooding in Houston, horses can handle extended water contact. Your horse can experience some limb swelling with prolonged water contact. In general, most horses can handle their limbs submerged for 48-72 hours. Body Balance Wellness Formula – Wellness Formula offers the horse’s immune systems multiple advantages in resisting pathogenic bacteria, viruses, protozoa, fungi, toxins, aflotoxins and environmental challenges. EquiSilver Wound Spray – This is a chelated wound spray that can be used in and around the eye. It works wonders with conjunctivitis weepy eyes. As it’s name implies it is excellent for wounds and punctures. It can also be used for rainscald, mudfever and other skin issues. Because it is chelated it can penetrate deeper than a normal topical spray. The Take Away – The point of our email is not to sell product but to help you be prepared. Lets face it natural disasters can hit any of us. Are we prepared? Do we have an evacuation plan? Do we have a “To Go Bag” for our horses with ownership and health records. Do we have a way of identifying our horse with our contact information if you are separated? When you get the call to evacuate is not the time to put these items together. That is the time to care for family and animals and leave. For those experiencing these natural disasters first hand our thoughts are with you for a safe return to your homes and ranches. Please be safe. Let us know how we can help.